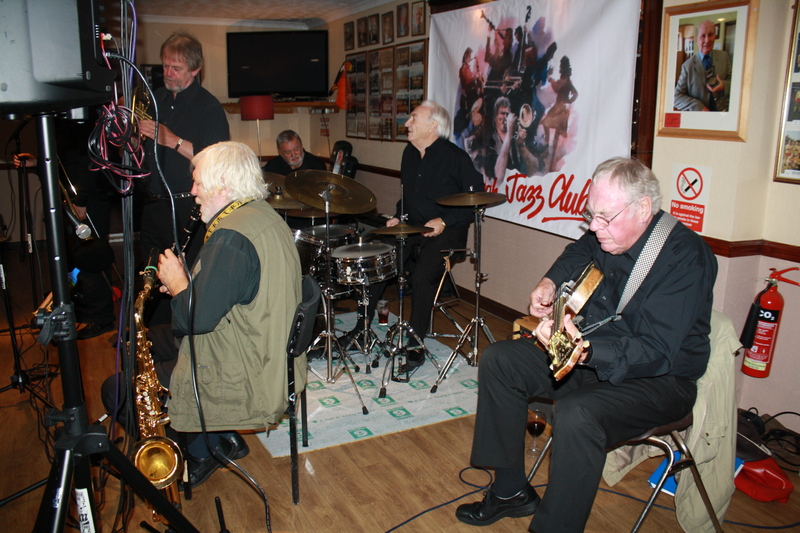 ‘BOB DWYER’S BIX & PIECES’, came on Friday, 25th September 2015 to our Farnborough Jazz Club. Bob Dwyer’s Bix & Pieces at Farnborough Jazz Club on 25th September 2015. 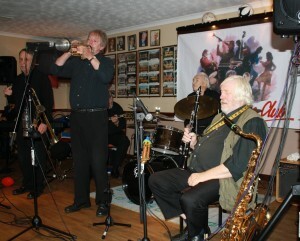 With Bob on trombone, Max Emmons on Trumpet, John Lee on reeds, Hugh Crozier on piano, John Bayne on d.bass & bass sax and Burt Butler on banjo, Photo by Mike Witt. 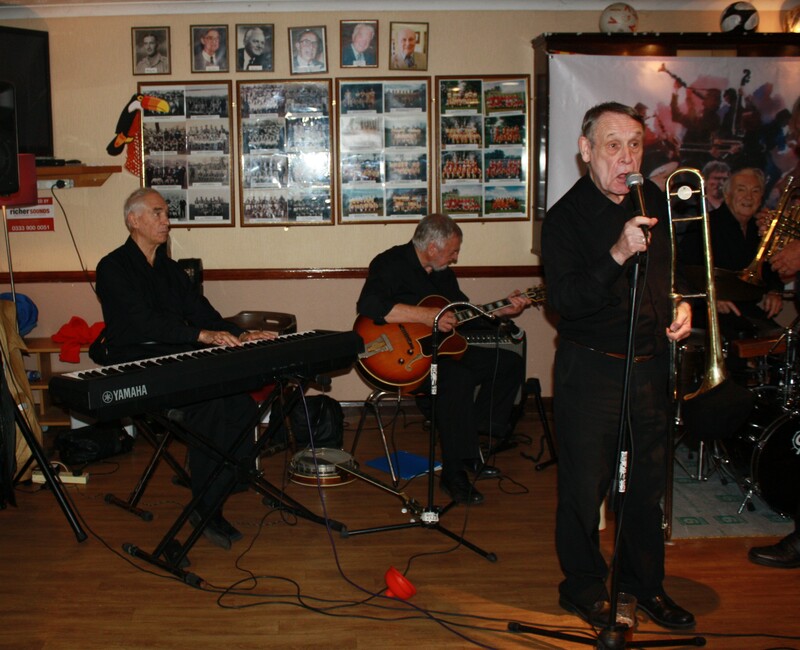 Trombonist & vocalist, BOB had MAX EMMONS on trumpet, JOHN LEE on clarinet & tenor sax, JOHN BAYNE on double bass & bass sax, HUGH CROZIER on piano, BURT BUTLER on banjo and CHRIS MARCHANT on drums. The evening began with a few horrors, including a huge traffic jam on the M25, so the band arrived after an horrendous journey. As one would expect, the first number was a little strained, but they soon got into stride and the whole evening’s music took charge of us and we certainly danced the evening away. I first took note of ‘Sunday’, a lovely happy tune, with a good tempo for dancing and sung by Bob. 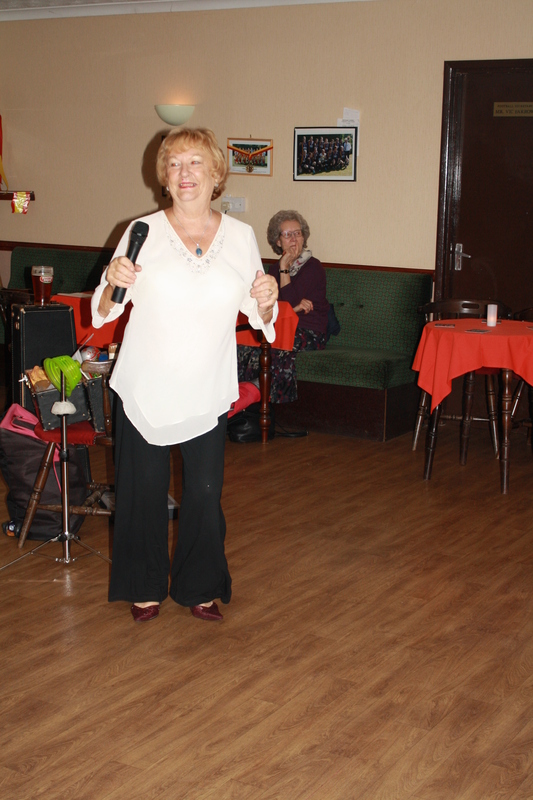 This was followed by ‘Creole Love Song’, giving more of a slower tempo for a waltz. However, the next tune was ‘Fidgety Feet’, very much ‘up tempo’ to which we performed our line-dance – wowie, another exhausting choice. Then what about ‘South’, another swinging tune – wonderful. Bob Dwyer’s Bix & Pieces at Farnborough Jazz Club 25Sep2015. Bob (pic) -trombone, Max Emmons (pic) trumpet, John Lee (reeds), Hugh Crozier (pic) piano, John Bayne (d.bass &bass sax), Chris Marchant (pic) drums & guest Burt Butler (banjo). Photo by Mike Witt. 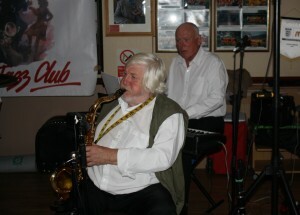 John Lee (tenor sax) and Hugh Crozier (piano) at Farnborough Jazz Club with Bob Dwyer’s Bix & Pieces. 25th September 2015. Photo by Mike Witt. Hugh also has a super voice ‘Hard Hearted Hannah’ being one of his special songs he enjoys singing and did so with much gusto. Next came Max, doing his bit’ with ‘Snag It’ and again, another super voice, PLUS adding his performance on harmonica – what a wonderful show. 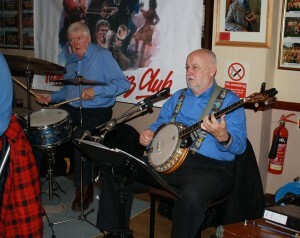 Burt Butler (banjo) & John Bayne (bass sax) at Farnborough Jazz Club with Bob Dwyer’s Bix & Pieces, 25th September 2015. Photo by Mike Witt. 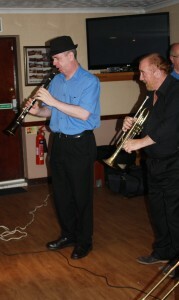 The next tune was brilliantly implemented by John (B) on ‘Big Bertha’ (Bass Sax). He played solo with the first verse of ‘Blue Skies’. Oh I just love him. Then came ‘My Little Bimbo’. Our guest player Burt sang it and of course he is quite a favourite character and known in these parts with his own band “Burt Butler’s Jazz Pilgrims”. They continued on with ‘Diggin’ My Potatoes’, Max is just brilliant with this one and I think the rest of the band all joined in with harmonizing. We had another go (oh, just four of us!) at a line-dance to ‘Puttin On the Ritz’, well it is just a perfect tune for our ‘Charleston’ effort to it. Finally, once again, Bob asked them all to play ‘Nice To Know You Care’ for Keith and me, the music being written by our dear late-friend Leslie Baguley (a big hit from the ‘40’s). N.B. Today (23rd September 2015) is the first day of the Autumn Equinox. The South Pole will see a glimpse of daylight for the first time in six months and the North Pole enters six months of dark – hmmm. Here in Kent, it is a beautiful morning – sunny and hot, with not a cloud in the wonderful blue sky. I had been swimming early this morning. Stopped off at Holwood Farm, Shire Lane (near Biggin Hill) for some tea and scones. I sat outside in the sun and enjoyed a lone Spitfire, with its Black & white striped D-Day markings on its wings, obviously enjoying himself and still around after Monday’s commemoration of the 75th anniversary of the Battle of Britain How I wish I had been up there with him. However, I feel lucky to be alive on such a glorious day, one to remember. Xtra…. This was all repeated this morning (25th September). The Spitfires are from Biggin Hill Heritage Hanger – see their website: Fly A Spitfire.co.uk – you can hire a flight with them – think of this if you need an idea to give a very special present to that someone who has everything. I also found out that Wednesday’s pilot was Don Sigourney and today’s was Richard Verral, who both flew on the D-Day Commemorations. This entry was posted in Bob Dwyer's Bix & Pieces on September 27, 2015 by Diane. 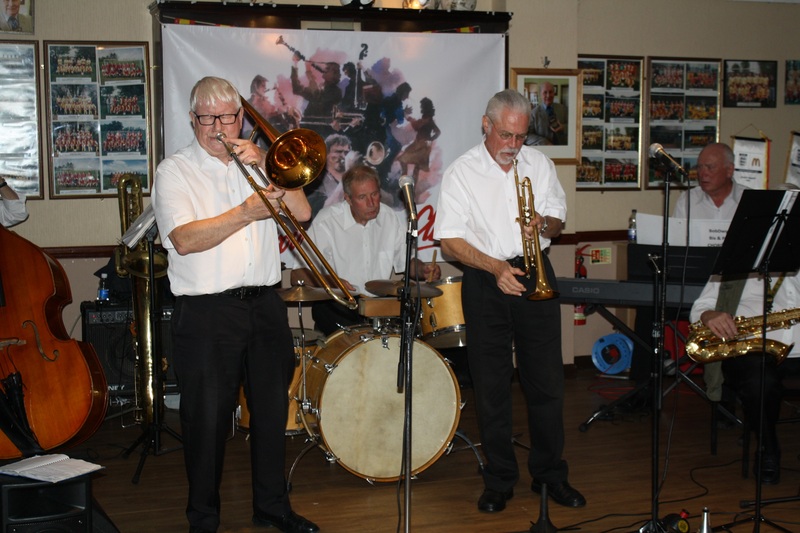 We were expecting another brilliant evening ahead of us again with GEORGE ‘KID’ TIDIMAN’S ALL STARS’ on Friday, 18th September 2015 at our FARNBOROUGH JAZZ CLUB. George is so full of fun and he and his band are so talented and so we were not disappointed. I had missed all the fun last time they were here, so I was expecting some special treatment from all of them this time (those extra kisses etc., hmmm!). Those poor stars who had to oblige me were obviously GEORGE (our ‘Kid’), plus DENNY ILETT on trumpet, TIM HUSKISSONon clarinet, ‘SOUTHEND BOB’ ALLBUT on banjo, JOHN SIRETT on double bass and BILL FINCH on drums. There was not too many of you in the audience, but none-the-less, those of you who came, created such an atmosphere with your whooping and dancing. We all loved ‘Southend Bob’ singing ‘Salty Dog Blues’. He has such a wonderful deep velvet voice and the song being such a fun song – I love how he finds them (a bit saucy though). 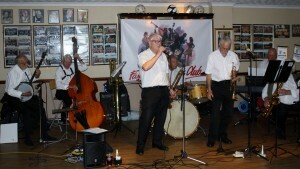 George ‘Kid’ Tidiman’s All Stars at Farnborough Jazz Club on 18th September 2015. 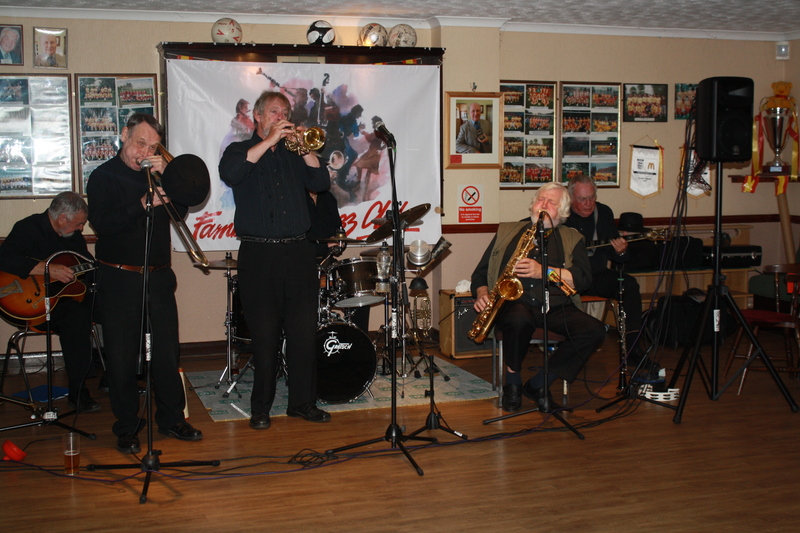 (LtoR) Tim Huskisson (cl), just hidden – John Sirett (d.bass), Denny Ilett (trmp), George ‘Kid’ Tidiman (trmb) and Bill Finch (drms), (also hidden – ‘Southend Bob’ Allbut (bnj). Photo by Mike Witt. George (our ‘Kid’) sang brilliantly the next number, ‘I Want A Little Girl To Call My Own’, probably made famous mostly by Harry James. 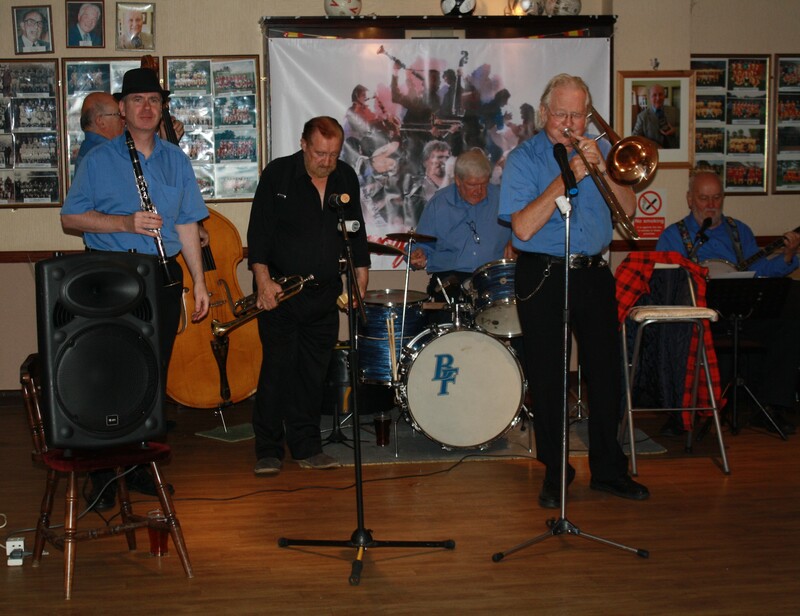 This was followed by ‘Kid’ Ory and Louis Armstrong’s ‘Canal Street Blues’, they certainly played their socks off to this one – all with fabulous solos. That lovely Latin number ‘Spain’ came next (I just love a Latin/American beat) certainly shows great playing by the ‘engine’ boys, John, Bill and ‘Southend Bob’. George entertained us next by singing ‘The Old Spinning Wheel’ and of course we all joined in (mostly with ‘lah lah-ing, of course) and I noted a bit of ‘Hi Ho – Hi Ho’ echoed after George (not quite sure what I meant – will have to ask him to repeat it next time they are here!). We had a real treat with someone in our audience – namely Jan Smith. [Keith used to play drums with Jan’s hubby, Barney Smith (guitar) and Nobby Willett (banjo – which he played it sounding just like a mandolin)]. 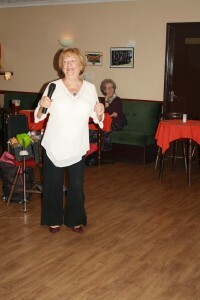 Jan sang a couple of songs, one being ‘Bill Bailey (Wont You Come Home)’, what a voice Jan has (a fantastic dancer too). 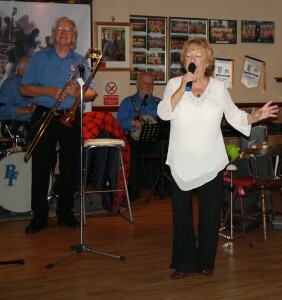 Jan Smith sings a couple of song with George ‘Kid’ Tidiman’s All Stars at Farnborough Jazz Club on 18th September 2015. Photo by Mike Witt. Jan Smith sings a couple of song with George ‘Kid’ Tidiman’s All Stars at Farnborough Jazz Club on 18th September 2015. George & ‘Southend Bob’ Allbut seen in background. Photo by Mike Witt. Our next bit of entertainment came from Bob (singing with his rich deep voice again) another one of his brilliant choices, ‘Alcoholic Blues’ – a song written during America’s prohibition time. 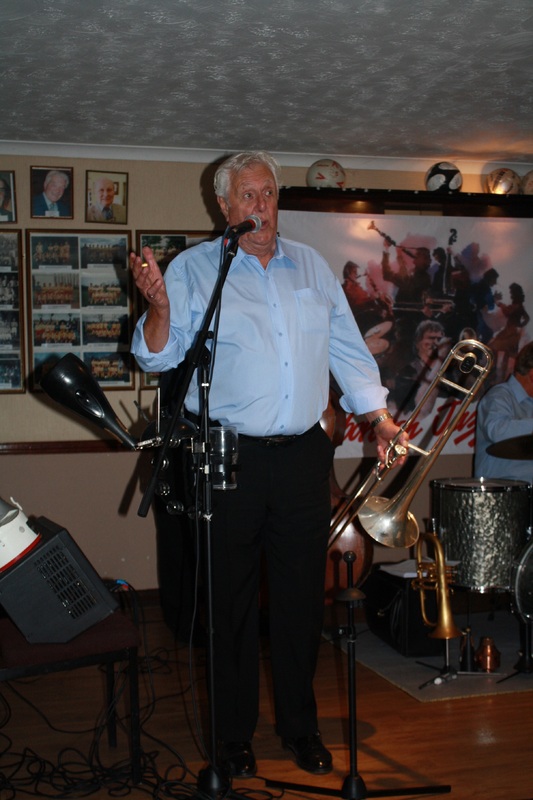 George was fabulous on trombone (I’m not a musician, so could have been a joke about having to match Bob’s voice – but it was mentioned they played it in lowest register – Bbflat). 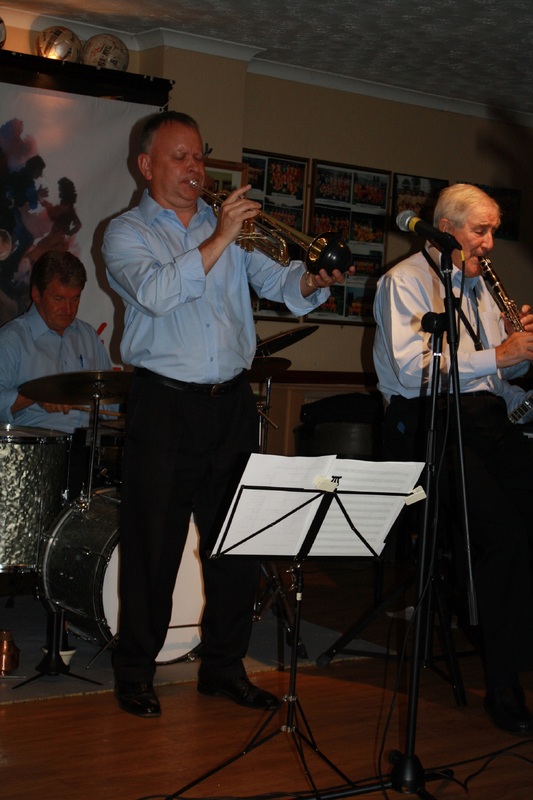 Tim Huskisson on clarinet and Denny Ilett on trumpet with George ‘Kid’ Tidiman’s All Stars at Farnborough Jazz Club on 18th September 2015. Photo by Mike Witt. Probably my favourite song of the evening has to be ‘Stardust’. Denny excelled on trumpet of course. He played a wonderful introduction and then they all joined in with this fabulous ‘Hoagy Carmichael’ number. I will finish off with a mention of a lovely solo from Tim with ‘The Girls Go Crazy About The Way I Walk’, which was sung by George – of course the girls do George! Thanks for another delightful evening. This entry was posted in George 'Kid' Tidiman's All Stars on September 21, 2015 by Diane. 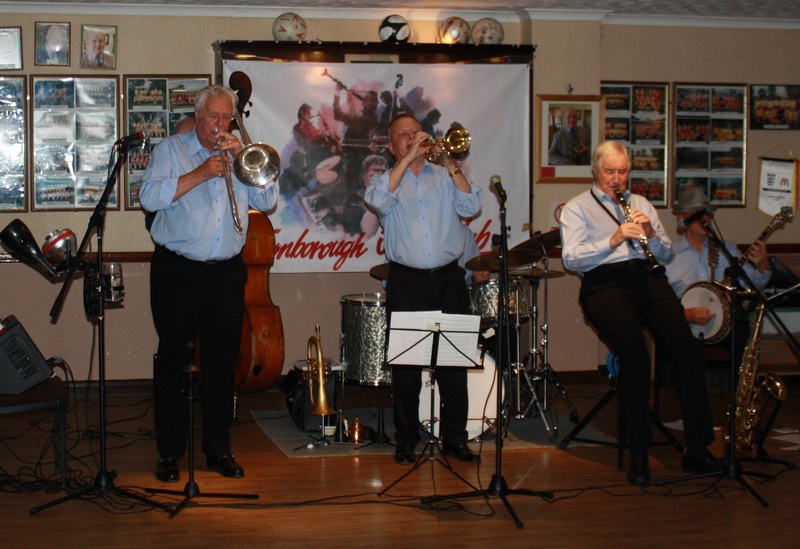 BARRY PALSER’S SUPER SIX, entertained us again at Farnborough Jazz Club, Kent on Friday, 11th September 2015. Well, that was certainly an understatement, because they were all tremendous. 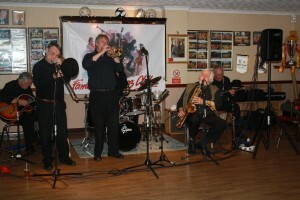 BARRY, on trombone &vocals, was joined by PETE RUDEFORTH on trumpet, JOHN CROCKER on clarinet & tenor sax, TONY PITT on banjo and JOHN TYSON on drums. Unfortunately, HARVEY WESTON couldn’t make it. However, Barry managed to get the brilliant ANDY LAURENCE (with his double bass), to hotfoot over to join us. 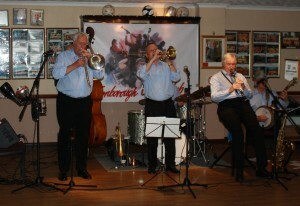 Phew, what a band – John (C) was 35yrs with The Chris Barber Band, with Pete still currently playing with them. 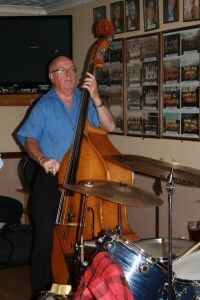 John (C) has also played for Elton John, plus guested with Kenny Ball and Ken Colyer Trust Bands. 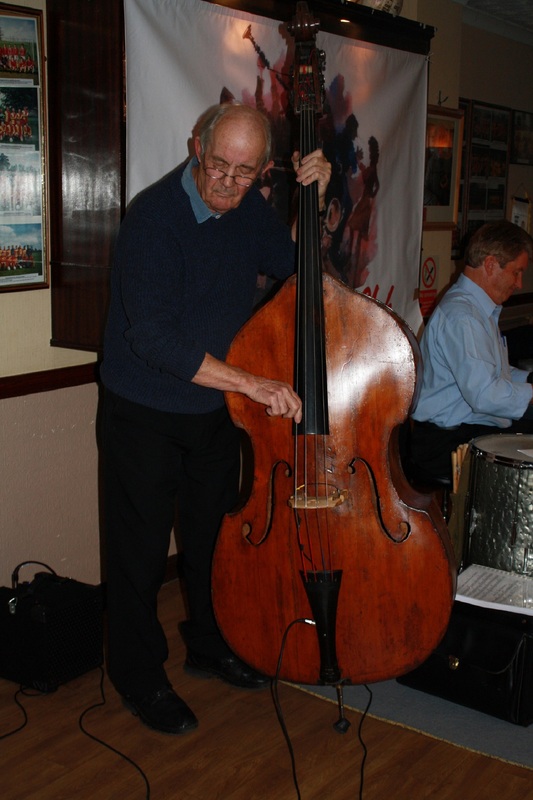 Also, Pete’s career has included working with such bands as Kenny Ball, Acker Bilk, The Pasadena Roof Orchestra, The Temperance Seven and George Melley, just to mention a few. 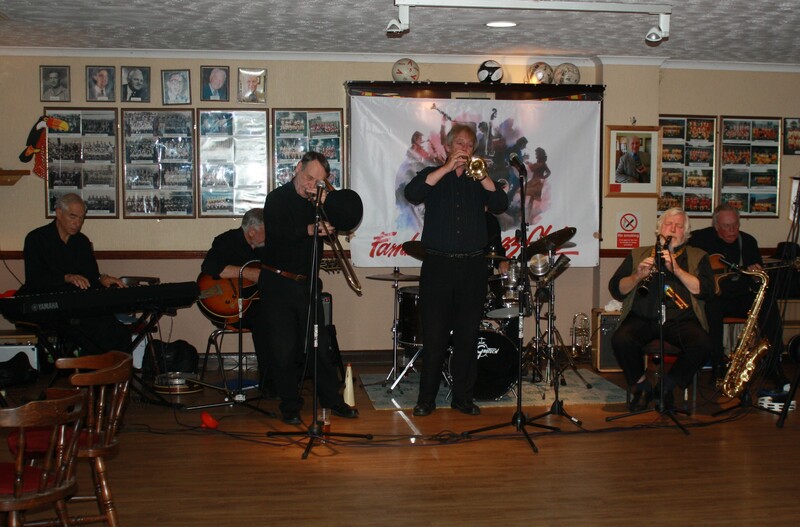 Tony has played with Alex Walsh, Acker Bilk, Kenny Ball, Alan Elsdon, Mike Cotton, Phil Mason, Laurie Chescoe and Terry Lightfoot Bands and, of course, Andy was also with the latter Band. 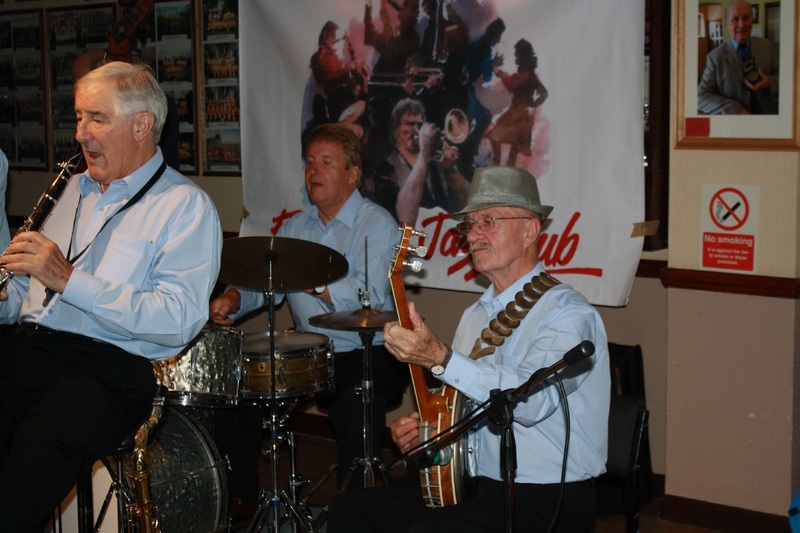 Barry Palser (presents his Super Six Band) at Farnborough Jazz Club 11sep2015. Photo by Mike Witt. Barry, who has always run his own band, is such a strong and likeable character and has always produced the best out of his ‘Stars’. He also has a special ‘extra’ that gives him a band to be proud of and that is Bridget, his wife. I believe Bridget travels to all the gigs, helping with the sound equipment and makes sure everything runs smoothly. Quite an asset. Now to get back to the evening. It was so hard to choose what to mention, from so many wonderful tunes (I don’t like to give a band’s complete repertoire away for playing at other places). Anyway, our evening began with that rousing popular tune, ‘Bourbon Street Parade’, a must to mention. Another fabulous number to add is ‘Black and Blue’ – oh wow, so beautifully played. John Crocker (clarinet), Tony Pitt (banjo) and John Tyson (drums) – three of Barry Palser’s Super Six at Farnborough Jazz Club, Kent on 11Sep2015. Photo by Mike Witt. Then John (C) sang ‘All Of Me’, obviously he did it proud. Not to be out-done came Pete singing ‘Nagasaki’, Actually, I shouldn’t have said that, because no one tries to outdo anybody! We then had John (C) performing his special – ‘Honeysuckle Rose’, yes a honey of a performance (John mentioned it was his second favourite tune, his first being ‘happy birthday’ ha.) As it happened, we had two birthday boys in the audience! The next number was requested by one of them (Bob), being ‘Kate Walking Baby’, sung by Barry. He apologised to me for not being able to perform it as well as he had done in the past, in other words, legs akimbo, much to our audiences’ laughter, but he can’t get his legs too far off the ground now-a-days. We all did our line-dance to the next song, being ‘Riverboat Shuffle’ (originally named ‘Freewheeling’). So many of us joined in this week, including male participants (much to the enjoyment/amusement of one chap’s other half). Giants play at Farnborough Jazz Club, Kent 11sep2015. John Crocker (clarinet) and Pete Rudeforth (trumpet), with John Tyson (drums) on 11th September 2015. Photo by Mike Witt. Next came Pete’s special, which was ‘Stardust’. 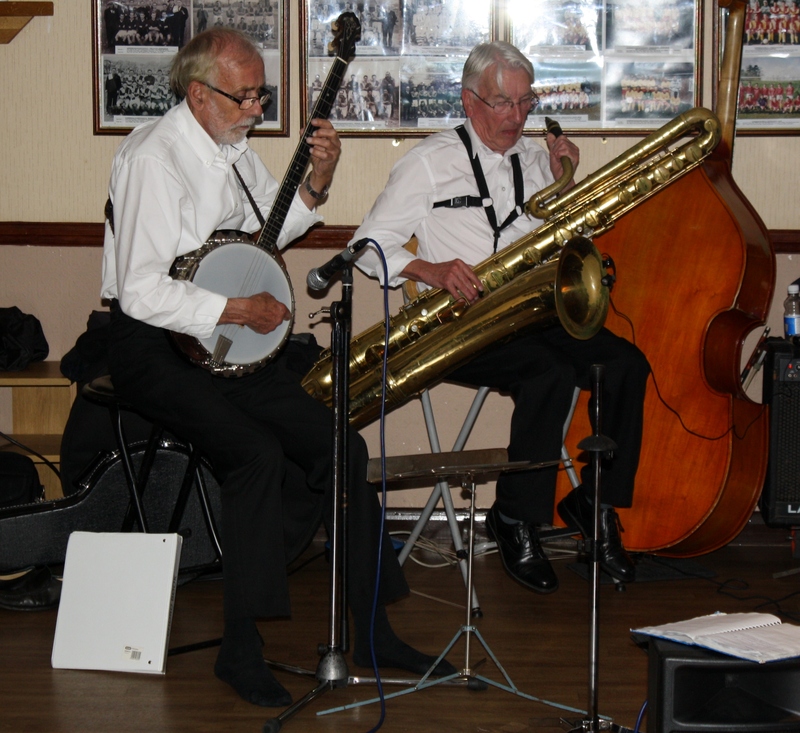 He plays a beautiful trumpet and we heard some superb banjo solos from Tony too. ‘Ace In The Hole’ is one that is always loved by our audience – joining in with such gusto (I think even Pete was surprised at this and enjoyed hearing us all). We also enjoyed the next number, ‘Mama Don’t ‘low’. Everyone excelled with playing their solos and this is when I can give special mention to the ‘engine boys’. 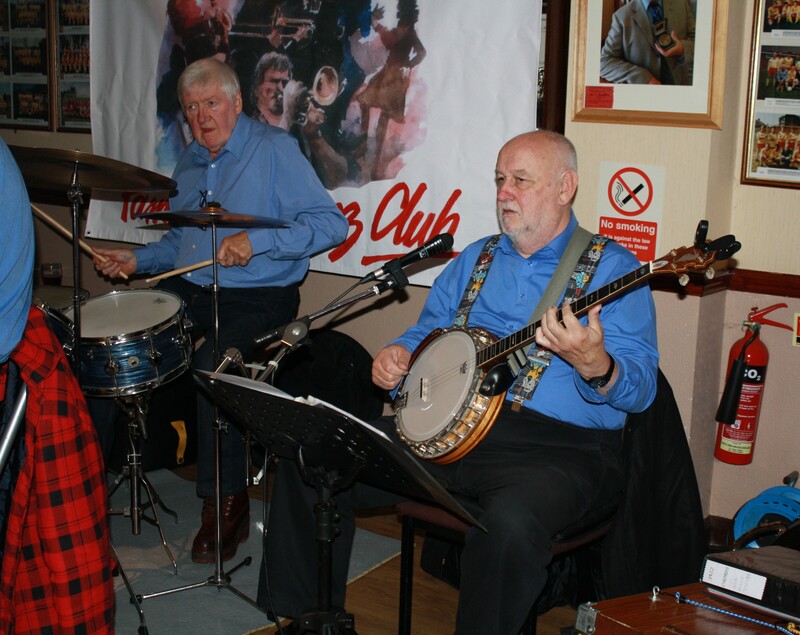 The exciting drums of John (T) – wow – and of course Andy on d.bass – tremendous and of course Tony on banjo. They tagged on a bit of ‘When the Saints Go Marching In’ for a little bit of fun. 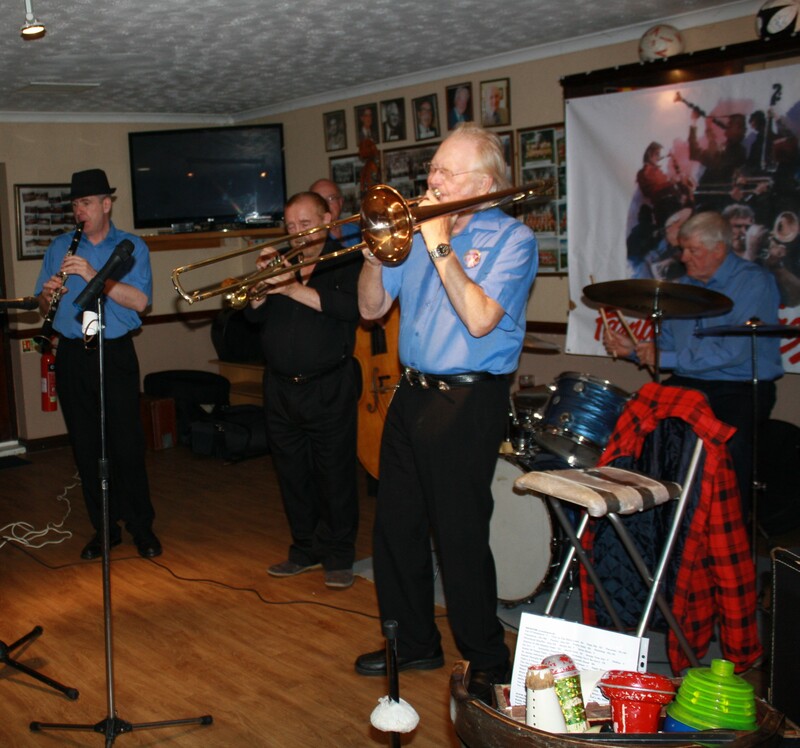 I know I have mentioned too many of their tunes (sorry Barry, but you did sing it – Satchmo style)), but I must mention your last number, ‘What a Wonderful World’ and yes, you were all given such an ovation. No wonder these guys were chosen to play with our famous bands, they are all individually brilliant themselves. 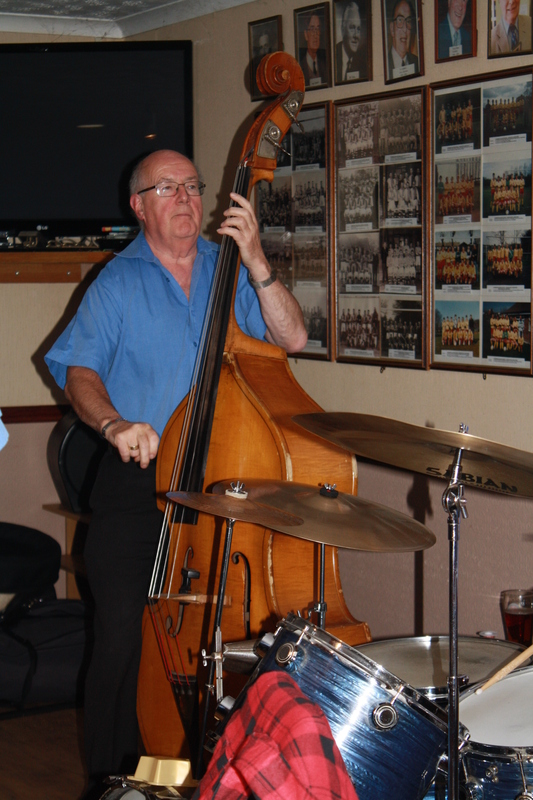 Andy Laurence (d.bass) plays for Barry Palser’s Super Six at Farnborough JC, Kent 11sep2015. Photo by Mike Witt. I said I was really looking forward to Friday, as had I missed the band the last time they were here, (said I had actually missed three weeks, which hadn’t happened in 25yrs). Well I hadn’t missed it. However, I have decided to complete newsletters as they come, beginning with this week and then backtrack on the others, otherwise I shall begin to lose the plot. I am starting to get forgetful (I get Keith to tell me his name everyday – ha). Actually, I do believe it is due more to doing too much and hopefully not due to old age, well that’s my excuse and I’m sticking to it! 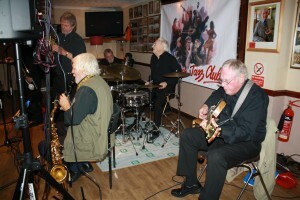 Keep jazz ‘live’ and you also help keep yourselves young too. This entry was posted in Barry Palser's Super Six on September 13, 2015 by Diane. Farnborough Jazz Club would like to join the many millions of huge wishes sent World Wide to congratulate Her Majesty, The Queen, becoming the longest reigning British Monarch. How young Her Majesty looks too and makes everyone so envious of her obvious fitness. Both Her Majesty and His Royal Highness, Prince Phillip are unbelievably hard working and long suffering, representing us on all our behalf and warrant our total admiration and thanks. God bless you both. This entry was posted in Uncategorized on September 9, 2015 by Diane.